Or view larger version. 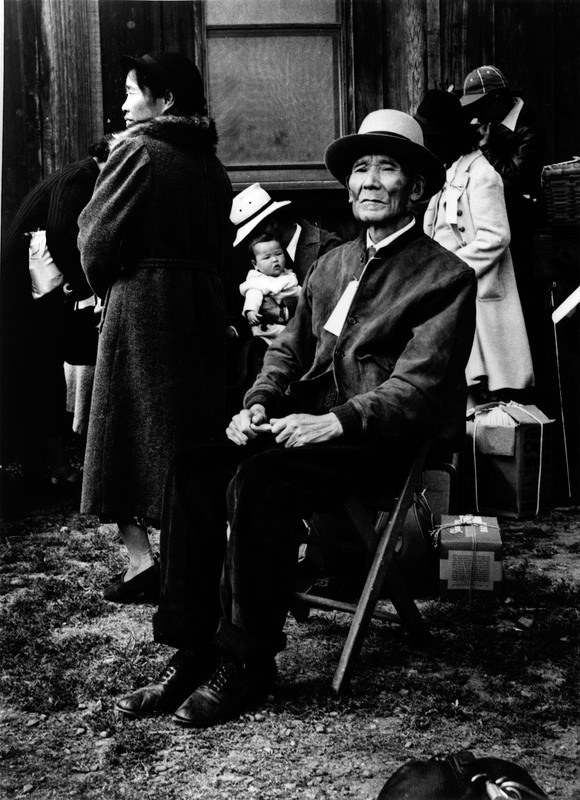 An elderly Japanese American man and a family with baby await relocation in Centerville, California. May 19, 1942. Dorothea Lange, photographer. Gelatin silver print. Collection of Oakland Museum of California. Gift of Paul S. Taylor. According to Michi Weglyn, in Years of Infamy, "Most of the 110,000 persons removed for reasons of 'national security' were school-age children, infants and young adults not yet of voting age." Evacuated within an eight-month period between March 24 - November 3, 1942, from California, Arizona, Oregon, and Washington, Japanese Americans packed two bags of necessities for daily living. Posted notices informed evacuees that they should bring only what they could carry, including for each member of the family bedding and linens (no mattresses); toilet articles; extra clothing; sufficient knives, forks, spoons, plates, bowls; and essential personal effects.